I have been waiting for this Montgomery brother to fall in love for quite some time and while I’m glad to finally get his story, I’m sad to see this series coming to an end. A powerful and successful businessman, Zach Montgomery has always prided himself in being the best, being in control of his life and making his own rules. Zach is a go-getter and an overachiever, so his inability to rally quickly from his climbing accident and having to depend on others for help is a big blow to him and he’s pretty much given up on himself. His family has just about had enough of his bad moods and general surliness and in a two-for-one deal conspires to manipulate him into fighting to get better and get him together with the woman he’s been interested in for the last five years. Gabriella Martine has been attracted to her boss for as long as she’s worked for him but knows to keep things between them professional. Her resolve is about to be tested as she works closely with him while he recovers from his accident, but she’ll do anything to keep him from losing his position as president of the company. Zach was such a meanie (I know, grade school word, but that’s the only one that kept flying through my mind) and I can understand how for such a confident person, having his body fail him could be the worst thing ever but he was just terrible. Gabrielle on the other hand, was a saint in my opinion for taking the constant lashing out and coming back for more, but as their story unfolds it’s clear that there is a lot more going on. Zach hates to be vulnerable at all but that Gabrielle has a front row seat makes it even worse and their unresolved personal issues are like an eight-hundred pound elephant in the middle of the room. The time alone was just what they needed for their relationship to flourish and I like that Zach was all in once he realized how he felt about Gabrielle, even though he was quick to bail when she needed him the most. I know I wouldn’t have stuck around for so long if I were in Gabrielle’s shoes and that was my only gripe about this book. That and the fact that she forgave him so easily. I would have milked it for what it was worth and made him grovel really hard (yeah, I’m mean like that!). However, I loved this story and I think that it’s fitting that Zach’s road to happiness would be such a tumultuous one because of his personality. He had to hit rock bottom to get an appreciation for the prize he had in Gabrielle and his wonderful family. 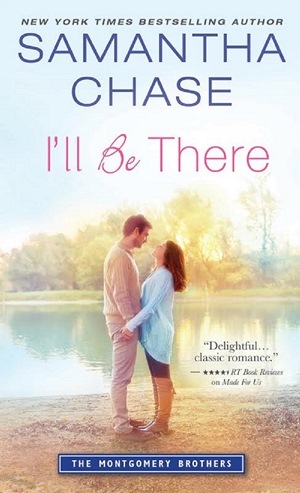 I’LL BE THERE is all about resilience, healing, family and love and is guaranteed to elicit a lot of emotions from readers, from the feel-good pleasure and happiness to the less than pleasant unease and anger, as Zach and Gabrielle fight for their happy ending.